In the analytic hierarchy process you define a set of criteria and sub-criteria arranged in a hierarchy, to do pairwise comparisons and find the weights of criteria or decision alternatives. In my AHP excel template the number of criteria is limited to ten, in my AHP online software to 15. Still sometimes I am asked to extend and allow for more criteria. 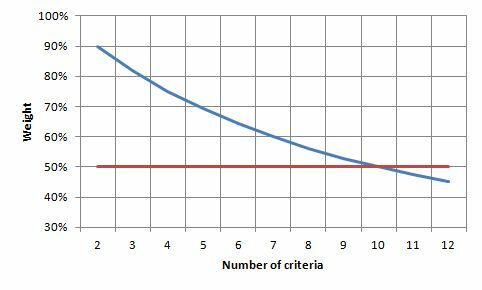 Why the number of criteria should not exceed the magical number seven plus or minus two? The first has to do with the human limits on our capacity for processing information, and was published by George A Miller, as well as in the context of AHP by Saaty and Ozdemir. The second is related to the first one. The number of pairwise comparisons increases with the number of criteria, it is (n2 – n)/2. For example, 9 criteria require 36 comparisons. For a high number of comparisons easily logical inconsistencies occur, and the consistency ratio CR exceeds values of 10% to 20%, making the basic assumption of near consistent matrices invalid and the AHP results questionable. with M = 9, the maximum of the AHP scale and n the number of criteria. The below diagram shows wmax as a function of the number of criteria. Clearly you can see that for 10 criteria the maximum possible weight reduces to 50%, or in other words, although you give full preference to one criterion, it only gets a weight of 50%! For more than ten criteria the weight will be below 50%. This is the reason, why the number of criteria should never exceed the magical number seven plus or minus two.